Tobacco is the only legal consumer product that kills at least 1 out of 2 of its regular users when used as intended by the manufacturer.1 There are approximately 1.1 billion smokers world-wide, and it is predicted that the use of tobacco could kill 1 billion people during the 21st century. Cigarettes contain tobacco, and tobacco contains nicotine, delivered rapidly to the brain when smoking tobacco. Nicotine is a single psychoactive substance that affects the brain and the central nervous system, among others. The disease of tobacco addiction (Nicotine Dependence, Tobacco Use Disorder) is recognized as a chronic disease by most authorities including the USDHHS, Health Canada, the many countries' Medical Associations, and the World Health Organization; it is classified as such in major disease classification systems.2,3 However, not every person who uses tobacco is addicted to nicotine. Tobacco addiction is a treatable disease and not simply a lifestyle choice. Addiction is a primary, chronic, neurobiological disease with genetic, psychosocial, and environmental factors influencing its development and manifestations. It is characterized by behaviors that include one or more of the following: impaired control over drug use, compulsive use, continued use despite harm, and craving.3 This condition is typically induced by repeated exposure to nicotine from tobacco, producing changes in the brain's motivational system as a consequence of which a reward-seeking behavior has become out of control.4,5 Decision-making and behavior are subsequently influenced by the underlying pathophysiological changes in the brain. Ninety percent of the population will try tobacco at least once in their lifetime, and about 90% of persons who become addicted will do so before the age of 18. Simulation models8 examine the overall effect of tobacco control policies and other interventions on estimated population quit rates. Graph 1 demonstrates some of the lost opportunities for cessation interventions on primary care for different disciplines. There is a robust body of evidence guiding effective tobacco cessation, and there exists a wide array of internationally recognized guidelines and opportunities for intervention with tobacco use and addiction. The US Public Health Service-sponsored Clinical Practice Guideline update identifies the ‘5-A’ model for treating tobacco use and dependence.9 This includes asking about tobacco use with every patient at every visit, advising tobacco users to quit, assessing willingness to make a quit attempt, assisting those willing to attempt quitting by offering counseling and medication, by motivating future quit attempts in those unwilling, and arranging for follow-up contacts. The overarching goal of these recommendations is that clinicians strongly recommend the use of effective tobacco dependence counseling and medication treatments to their patients who use tobacco, and that health systems, insurers, and purchasers assist clinicians in making such effective treatments available. It is essential that clinicians and healthcare delivery systems consistently identify and document tobacco use status and treat every tobacco user seen in a healthcare setting. 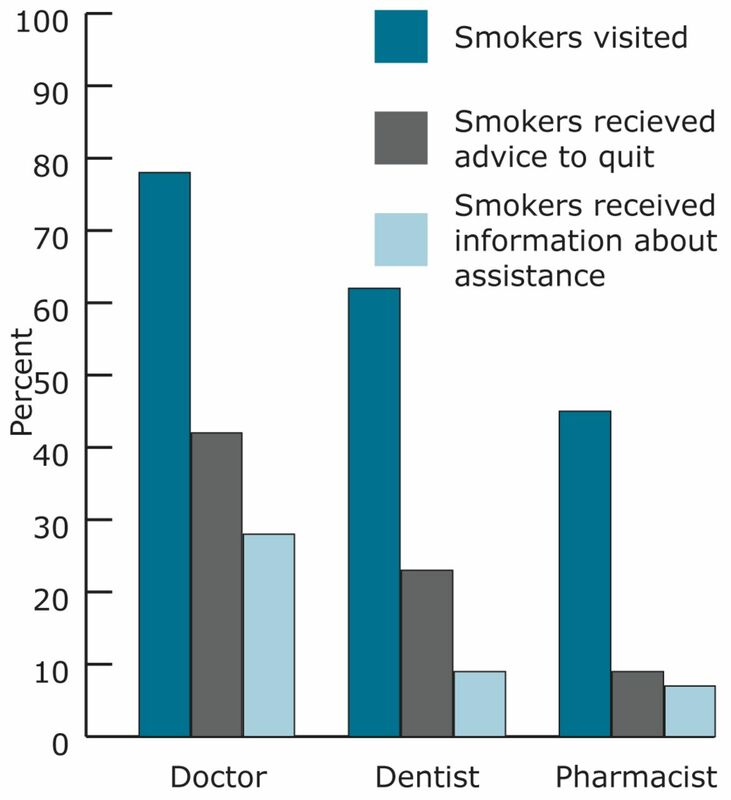 Tobacco dependence treatments are effective across a broad range of populations. Clinicians should encourage every patient willing to make a quit attempt to use the counseling treatments and medications recommended in the Guideline. Brief tobacco dependence treatment is effective. Clinicians should offer every patient who uses tobacco at least the brief treatments shown to be effective in the Guideline. Numerous effective medications are available for tobacco dependence, and clinicians should encourage their use by all patients attempting to quit smoking—except when medically contraindicated or with specific populations for which there is insufficient evidence of effectiveness (i.e. pregnant women, smokeless tobacco users, light smokers, and adolescents). Clinicians should consider the use of certain combinations of medications identified as effective in the Guideline. Counseling and medication are effective when used by themselves for treating tobacco dependence. The combination of counseling and medication, however, is more effective than either alone. Thus, clinicians should encourage all individuals making a quit attempt to use both counseling and medication. Telephone quitline counseling is effective with diverse populations and has broad reach. Therefore, both clinicians and healthcare delivery systems should ensure patient access to quitlines and promote quitline use. 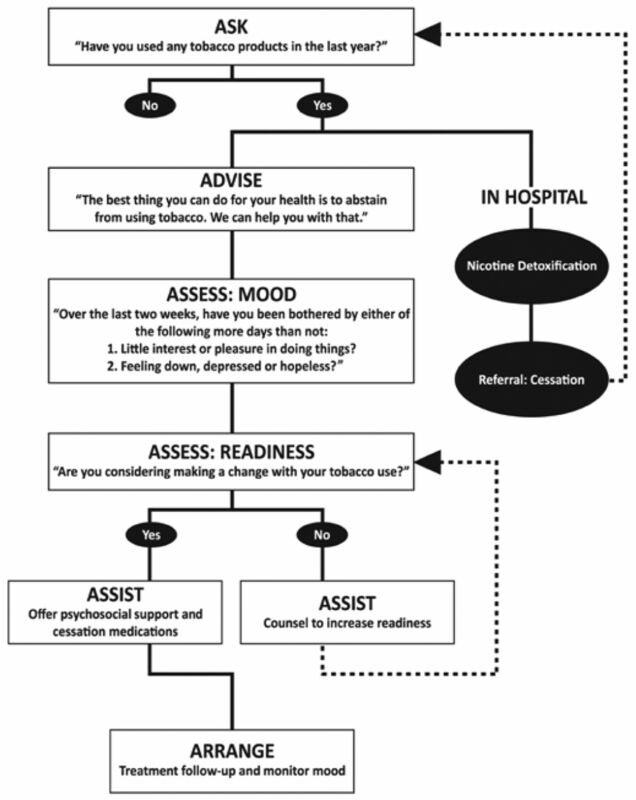 If a tobacco user currently is unwilling to make a quit attempt, clinicians should use the motivational treatments shown in the Guideline to be effective in increasing future quit attempts. Tobacco dependence treatments are both clinically effective and highly cost-effective relative to interventions for other clinical disorders. Providing coverage for these treatments increases quit rates. Insurers and purchasers should ensure that all insurance plans include the counseling and medication identified as effective in the Guideline as covered benefits. Consistent with the FCTC Article 14,7 Canada released its first federally funded set of Clinical Practice Guidelines through the Canadian Action Network for the Advancement, Dissemination and Adoption of Practice-informed Tobacco Treatment (CAN-ADAPTT).11 Given the high level of co-occurrence of mood symptoms in persons who use tobacco and/or stop its use, the basic algorithm included in CAN-ADAPTT allows integrated and brief screening of mood in the treatment of tobacco use and addiction. Among those who currently smoke tobacco, approximately 70% would like to stop and about half of these will try to quit at least once this year.10 The use of short-term, acute care models to manage chronic, non-communicable diseases is theoretically inconsistent. Hypertension, hypercholesterolemia, obesity, diabetes, depression, chronic obstructive lung diseases and addiction are some diseases that often require repeated interventions. Following a short-term approach for tobacco-addicted individuals is equally illogical and compromises the chances of long-term cessation success. Evidence-based smoking cessation is both safe and effective and appears to be one of the most robust and clinically meaningful interventions healthcare professionals could offer.
. WHO report on the global tobacco epidemic, 2008: The MPOWER package. Geneva: Author; 2008.
. Diagnostic and statistical manual of mental disorders, text revision, 4th ed. Washington DC: Author; 2000.
. ICD-10: International statistical classification of diseases and related health problems, tenth revision. Geneva: Author; 2007.
. Theory of addiction. Alcohol Alcohol. 2006;42(2):161-3.
. A conceptual framework for explaining drug addiction. J Psychopharmacol. 1998; 12:3-7.
. Drug dependence, a chronic medical illness: implications for treatment, insurance, and outcomes evaluation. JAMA. 2007;284:1689-95.
. Reaching healthy people 2010 by 2013—a SimSmoke simulation. Am J Prev Med. 2010;38:S373-81.
. The health consequences of smoking: a report of the Surgeon General. Atlanta: US Department of Health and Human Services, Centers for Disease Control and Prevention, National Center for Chronic Disease Prevention and Health Promotion, Office on Smoking and Health; 2004.
. Smoking cessation: intentions, attempts and techniques. Statistics Canada: Health Reports. Catalogue no. 82-003-XPE. Ottawa: Statistics Canada; 2009.